The annual Native American Festival in St. Ignace is a celebration filled with activities, demonstrations, music, and food. 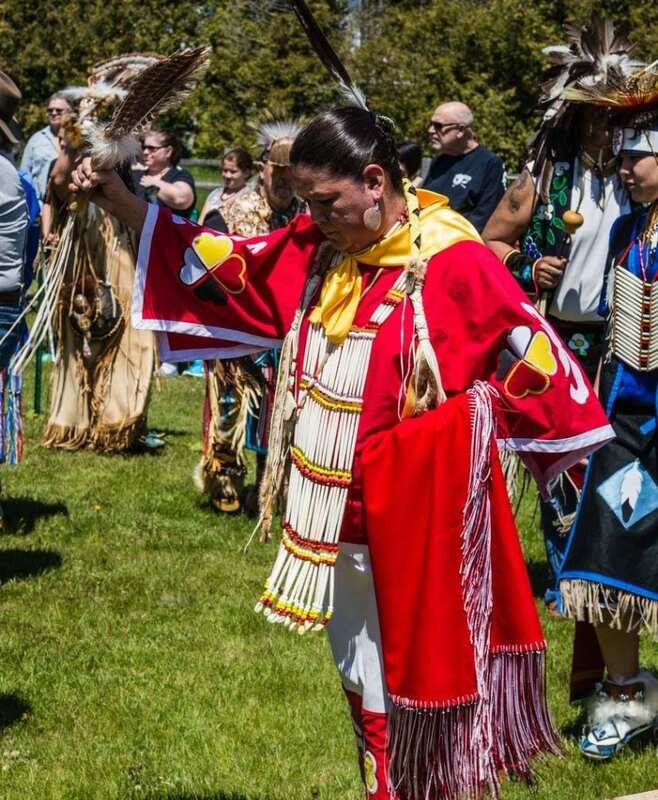 The 2018 Native American Festival is May 26 and May 27 at the Museum of Ojibwa Culture in St. Ignace, Michigan. The day recognizes and celebrates the contributions of the Anishinaabe people, and visitors will discover a rich culture through drumming, dancing, storytelling, traditional arts, and workshops. Grandmother Moon Drummers and Singers and the Healing Lodge Singers, 11 a.–1 p.m. Guided tours of the museum grounds and the museum with a cultural interpreter, 11 a.–1 p.m.
Grand Entry, 1 p.m. The honor guard, veterans, and elders lead the dancers into the circle. Then comes the many generations of men, women, and children. Traditional drumming and dancing, 1–5 p.m. Guided museum and grounds tours with a cultural interpreter, 11 a.m. Guided historic walking tour with a local historian. Walking tour begins at the museum, 11 a.m. Cultural Workshops for Adults and Children, 1 p.m.
Museum director Shirley Sorrels tells us more about the festival. What are some of the highlights people will see on the guided museum tours? On the guided tours, our visitors will discover our outdoor exhibits, the international award-winning Anishinaabe Clan Park, our Anishinaabe Sculpture Park featuring life as it was centuries ago, and our traditional longhouse. People can walk through the longhouse and imagine what it would be like to live in such a home with their family. The Marquette Mission Park, where Father Jacques Marquette established a mission amongst the Huron Indian refugees in 1671, is one of the oldest historical sites in the State of Michigan. His burial site is on the museum grounds. Within our museum, our tour guides will talk about the Ojibwa migration which led them to the area, how they survived in a harsh environment, Ojibwa family life, generational effects of the residential boarding schools, the fur trade, and the coming of the missionaries. In our museum store, the tour guide will show the traditional and contemporary artwork of our artists. Tell us about the Grandmother Moon Drummers. This year we will have two women’s drum groups to share drumming, songs, and traditional teachings. A traditional Elder, Tony Grondin from St. Ignace, invited his cousin Gennie Morgan to make a woman’s hand drum because he felt the women’s songs were dying and being forgotten. He felt she was to carry on the tradition. Rose Newman from Cheboygan helped Gennie to bring forth the traditional songs. Others started to join and the group now consists of up to 10 drummers. Gennie feels that this path of learning the songs has given her much growth and grounding in the Native culture. Is there a favorite demonstration among kids or a must-do activity? There is something for all ages; dancing, music, food, traditional sharing of a living culture, experiencing the sights and sounds of the pow wow, craft demonstrations, and many opportunities for visiting families to interact with the pow wow participants. Tribal Elders will be on the grounds to share cultural values, traditions, and storytelling. Children and their parents love to participate in interactive experiences such as making beaded chokers and traditional medicine pouches, learning to sing a traditional song, and coloring workshops. Our most popular workshop for children last year was the clan coloring workshop and making chokers. How important is the Anishinaabe culture to the St. Ignace community? In our local schools, 50–60 percent of the youth enrolled are registered as being of Native American descent. The local Sault Tribe of Chippewa Indians play a huge role in their economic contributions to our community and its citizens and they support the funding of the Native American Festival each year. The Ojibwe people of our area have influenced many areas of community living. They have always had a deep respect for the land and lived in harmony with nature, never killing anything they could not use. Ecology was an assumed way of life. Many of the foods we eat today were first grown by the Native people and they helped the European settlers survive by sharing their farming methods with them. They were primarily hunters and fishermen and greatly influenced the fur trade in our area. The Ojibwa people are the original people of the Upper Great Lakes region whose ancestors were scattered through Ontario, Michigan, Wisconsin, and Minnesota. It is important to preserve the culture of the Anishnabeg—an Ojibwe term describing the original peoples who were the first residents. The Tribal Elders of our community recognize the importance of bringing back traditional teachings and ceremonies and work diligently with the museum to create projects that tell their story. Many times people forget the fact that the Native Americans were here first and only think about the settlers and their contributions. After the feast, where should people go near St. Ignace to learn more about the Anishinaabe Culture? The Sault Tribe Culture Library and the Tribal Culture Department are located at 531 Ashmun Street in Sault Ste. Marie. The Museum of Ojibwa Culture is open from May 19 to October 31. We have a large assortment of Ojibwe books and the museum tells the story of the Ojibwe people. 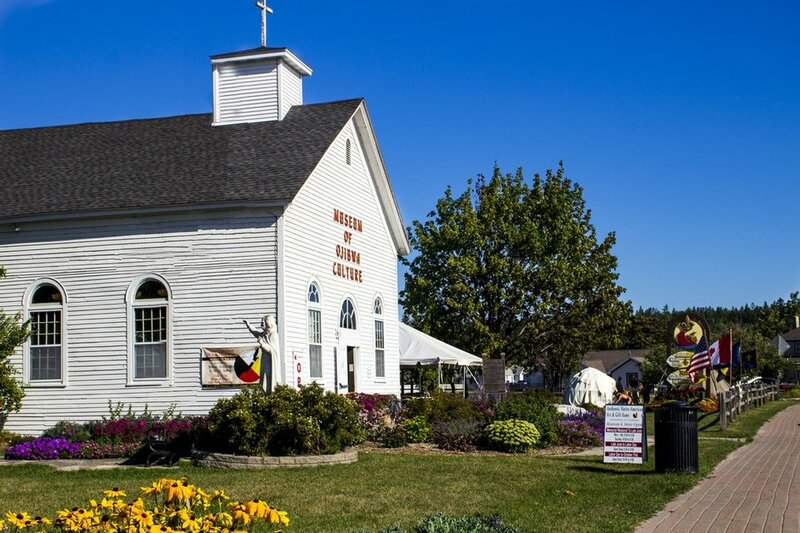 Tthe Museum of Ojibwa Culture and Marquette Mission Park interpret the rich archaeology and history of the 17th-century Huron Indian Village, Father Marquette’s French Jesuit Mission, and local Ojibwa traditions and culture through innovative indoor and outdoor exhibits. The museum and park portray a vivid picture of life in the Straits of Mackinac more than 300 years ago when the Ojibwa, Huron, Odawa, and French met in St. Ignace. This is also where the French Jesuit Mission was located and is the final resting place for Father Jacques Marquette. The mission site is registered as a Michigan State Historic Site, a National Historic Landmark, and is listed in the National Register of Historic Places. The museum is the winner of the 2011 Michigan Historic Preservation Network Community Award and received a Certificate of Excellence from Trip Advisor for the 2017 season. Admission is by donation and 100 percent of the donations go to the upkeep of the 180-year-old church building. Win a Four-Night St. Ignace Summer Vacation!